E-Brock Bugs is a serious educational game (SEG) about probability which was created based on Devlin's design principles for games whose players adopt identities of mathematically able persons. This kind of games in which “players think and act like real world professionals” has been called epistemic. This article presents an empirical study of 16-year-old students' (n=61) experience playing E-Brock Bugs as part of their mathematics data management course. Results suggest that most students engaged in the game's mathematics and experienced a mathematical in-game identity. E-Brock Bugs contributes to validate Devlin's game design approach to epistemic mathematics SEGs. Digital games have become ubiquitous in our lives. Mayo (2009) indicates that such games have millions of users and also “embed many pedagogical practices known to be effective in other environments” (p. 79). 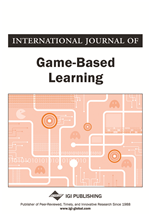 Beyond their entertainment value, playing video games may also positively impact students’ learning (e.g., Aldrich, 2004; Gee, 2003; Mohamed & Jaafar, 2010) and cognitive development (e.g., Anguera et al., 2013; Green & Bavelier, 2003, 2007de Freitas & Levene, 2004). Such benefits may be attributed to the intrinsic nature of games or, as Gee (2013) summarily notes, because “games are just well-designed experiences in problem solving” (p. 17).